This dugout was located on the homestead of Luther Kreigh, on the west side of present-day Highway 27, seven miles north of Johnson City, Stanton County, Kansas. Luther Kreigh ran the stage line and mail hack between Syracuse and Richfield and this dugout served as a stage stop on that line. The stage changed teams here and a post office located in the building was called on the maps "Liverpool." This photograph shows a dust storm in Stanton County, Kansas. Here are two photographs of exhibits at the Seward County fair in Liberal, Kansas. The image with the ears of corn and other agricultural products has a sign that says "Stanton Co. Exhibit By L. Dickey & Co." The other image has a steer's head and a spinning wheel, with some quilts in the background. This black and white photograph shows members from the George Henry family slicing into watermelons on their farm in Stanton County, Kansas. These are panoramic photographs of locations in Kansas created by the Kansas Film Commission to promote scenes to film companies. The panoramics were created by taking individual photos and taping them together. The photographs are arranged alphabetically by subject and then location. This box includes a variety of subjects, including auto salvage yards, catering units, energy plants, libraries, and telephone booths. Some subjects in this box are represented in other boxes of the collection, such as churches (see Kansas Memory unit 303440), courthouses (see Kansas Memory unit 304620), crops (see Kansas Memory unit 304621), farmhouses (see Kansas Memory unit 304731), parks (see Kansas Memory unit 305577), and ranches (see Kansas Memory unit 307231). These are panoramic photographs of locations in Kansas created by the Kansas Film Commission to promote scenes to film companies. The panoramics were created by taking individual photos and taping them together. The photographs are arranged alphabetically by subject and then location. Roads and highways, arranged by county, are the subject included in this part of the collection. These are panoramic photographs of Kansas towns beginning with Leavenworth and ending with Norway. The Kansas Film Commission created the photos to promote Kansas locations to film companies. Many of the photographs show business districts and buildings. The panoramics were created by taking individual photos and taping them together. Towns and cities included in this part of the collection are: Leavenworth, Ludell, Luray, Lyndon, Lyons, Manchester, Manter, Marion, Mayetta, McCune, McDonald, McFarland, McPherson, Medicine Lodge, Melvern, Menlo, Meriden, Merriam, Milan, Miltonvale, Mission, Moline, Monument, Morganville, Morrill, Moscow, Mulberry, Mullinvale, Mulvane, Munden, Narka, Natoma, Nekoma, Neodesha, Neosho Falls, Neosho Rapids, Netawaka, New Albany, Newton, Nicodemus, Norcatur, Norton, Nortonville, and Norway. Photos of courthouses are included for several communities. Some of the photos of communities show churches, grain elevators, water towers, parks, public/government buildings, railroad depots and tracks, and residences. There are some aerial photographs for McFarland and Melvern. This item is correspondence related to the Kansas Woman's Press Association. The postcards are, primarily, a listing of the names of female newspaper editors, typesetters, reporters, publishers, and contributors from Kansas counties. The other correspondence deals with the work of the organization. 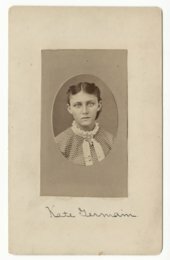 Miss Zu Adams, who assisted her father as secretary of the Kansas Historical Society, acted as secretary for the Kansas Woman's Press Association in Topeka, Kansas. These two artifacts were collected by Kansas Historical Society staff in 1994 from an Early Ceramic Period campsite in Stanton County. The smaller artifact is a fragment of a corner notched arrow point. Archeologists consider corner notched points to be the earliest form of arrow points that are found on the Great Plains. The larger artifact is a preform, which could later be made into a projectile point. They are typically triangular shaped. Creator: Hall & O'Donald Topeka Litho. Co. This is a map showing a plat of Johnson City and Stanton County, Kansas, presented by Van Noorden & Starnes, Johnson City, Kansas. The map shows the Chicago, Rock Island & Pacific Railroad; Atchison, Topeka & Santa Fe Railroad; Wichita & Western Railroad; and Montana, Kansas, Texas Railway lines in Stanton County. Also, the Southern Stage line is shown on the county map. The text on the map promotes the settlement of Johnson City and Stanton County. This black and white photograph shows George L. Henry, Dora Le Henry, and Mrs. J.B. Spires sitting inside a Model T Ford. The group are on their way to shop in the town of Johnson City in Stanton, County, Kansas. The native stone home of John Raney, built about 1885 when the Raney family homesteaded in Stanton County, Kansas. The Raneys grew peaches and other orchard produce on their farm. Town maps taken from the Official Atlas of Kansas, published in 1887. These individual maps were cut out of the atlas and each was labeled "Everts, 1886". Not every town found in the original atlas is represented here. Towns are arranged alphabetically.